IS TESLA about to release self-driving cars? This has been the question on everybody's lips for years now. The latest data out from the USA suggest the company may not be nearly so close as we hoped. California makes every car company that tests autonomous cars on the state's roads release a report each year. The reports came out for 2017 and Tesla is mysteriously absent. It claims it did not test any cars in California last year. This is intriguing. Tesla's offices are in California and its car manufacturing plant is in California. It tested autonomous cars on the road in that state in 2016. Why stop in 2017? 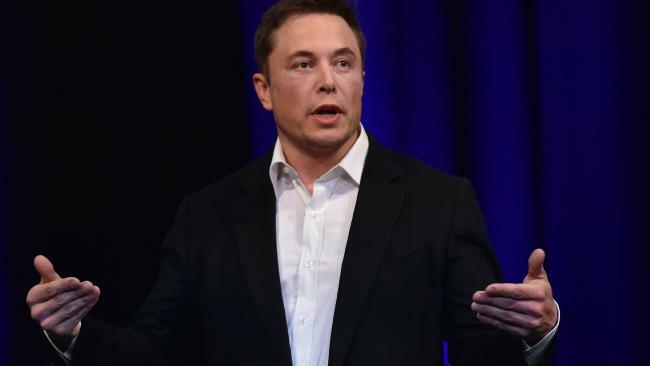 Tesla CEO Elon Musk is not usually reluctant to boast about progress. His social media is full of claims and boasts about how fast Tesla (and his other companies) are going. Tesla claims it is still doing testing, just not in California. It raises a question: if Tesla is choosing to do its testing in a place where it doesn't have to report its results, does that suggest it is proud of its progress? Competition in self-driving cars is intense. The company that can make a safe self-driving car will have a huge market at its fingertips. Billions of dollars are up for grabs. Trillions maybe. Self-driving is showing itself to be a harder challenge than electric propulsion and I believe it will bring more value to car owners. 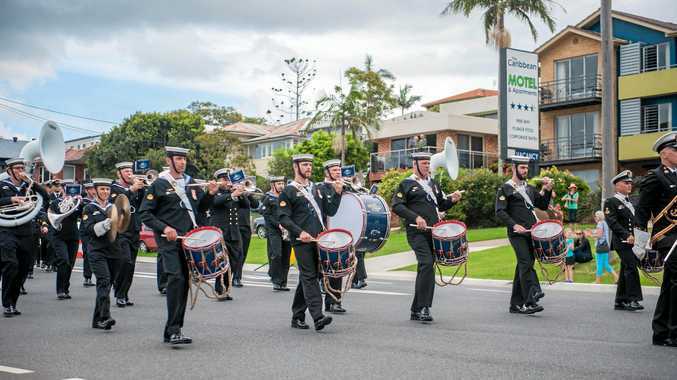 It could turn commutes into productive time, reduce accidents and blast away traffic jams. And the benefits go beyond that: Imagine being able to nap down in the back of your car in Melbourne and wake up the next morning in Sydney. The state of California demands anyone testing self-driving vehicles on their roads keep a person in the driver's seat. They must report how many miles were driven and how often the driver had to take over from the autonomous system. This is known as disengagements. 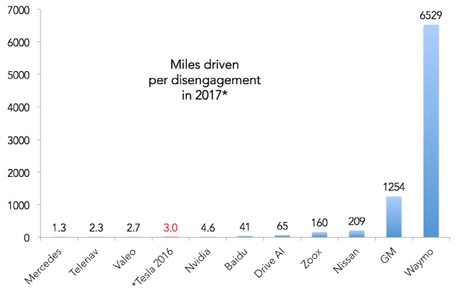 Disengagements per mile help indicate how advanced some of the driverless systems are. Beware, the data are not perfect. It might be possible to game them by setting an autonomous car loose to drive up and down a very safe street. Some nervous test drivers might intervene in the car's operation more than others. And some companies might count things slightly differently. All that can affect the data. But for now it's the best we have. The next chart shows how many miles you can expect to go by in an autonomous car before the driver takes over. In the Mercedes autonomous car, it's 1.3 miles, or about every 2km. In the Google (Waymo) autonomous car, it's every 6,500 miles, or about every 10,000km. The rest are in the middle. All the results are from 2017, except Tesla. Its 2016 result is included for reference. Tesla didn’t report its 2017 results; while Google is racing ahead with driverless technology. Tesla has had a number of embarrassing missteps and dangerous crashes with its autopilot system. A man died when his car drove itself right into a truck several years back. Just a few weeks ago another Tesla crashed into a big red firetruck while in autopilot. Tesla's self-driving division is showing signs of issues. Not only losing top staff but also technology. It had a relationship with a supplier of autonomous driving technology called MobilEye, but some time after the fatal crash the two companies went their separate ways. When Tesla rebuilt their own system from scratch it took a long time to catch up to where MobilEye had been. Elon Musk, undeterred, promised a Tesla would be able to drive all the way across America without driver intervention by the end of 2017. That didn't happen. And in what has become folklore among Tesla-watchers, he made the following famous statement about how long it would take for Tesla's self-driving technology to evolve from the current autopilot. 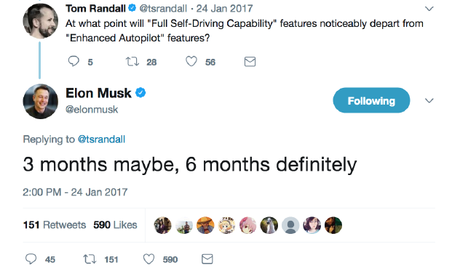 "3 months maybe, 6 months definitely," Musk said. More than 12 months later, there is no sign of full self-driving. Elon Musk probably regrets this tweet. But is it possible Tesla, despite all the signs, is actually ahead of everyone? It says it is using "shadow mode" to do miles of testing using "hundreds of thousands of customer-owned vehicles." "In "shadow mode," features run in the background without actuating vehicle controls in order to provide data on how the features would perform in real world and real time conditions. This data allows Tesla to safely compare self-driving features not only to our existing Autopilot advanced driver assistance system, but also to how drivers actually drive in a wide variety of road conditions and situations," the company says. In theory this can give Tesla huge advantages. But unlike real world testing, where companies report the miles done, Tesla forces us to take their word for it. Theoretical testing might also put it at a big disadvantage with the Californian regulator if it ever tries to get a full self-driving vehicle approved. Would it really put Tesla ahead of companies whose systems have been rubber-on-tarmac for years? When it comes to autonomous driving Tesla has been trading off promises for years. But the moment is coming where we need to see results to believe them. Before long human drivers are going to disengage from the company's self-driving claims.